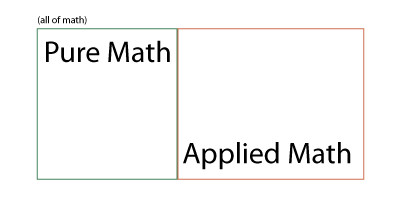 Applied math is about modelling systems (e.g. physical systems) using calculus and tools derived from calculus. Pure math can be thought of as a combination of two sub-fields: algebra and analysis. 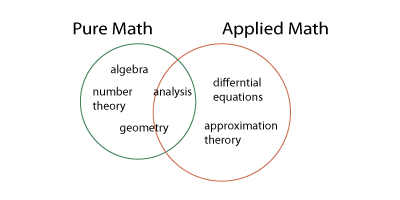 Algebra deals with properties of sets objects that can be operated on (i.e. added/subtracted/composed), and analysis provides a rigorous basis for calculus (i.e. a lot of epsilon-delta proofs). Since applied math relies on calculus, analysis is a topic of interest to applied mathematicians as well. Thus pure and applied math intersects. Computer science uses many ideas from pure math, and some computer science theorems and proofs read like theorems and proofs from algebra. Machine learning, a computer science discipline, is really just another name for statistical learning. There are other topics in mathematics, but I don't know about them enough to come up with a full taxonomy. Moral of the story is: pure math and applied math do intersect. 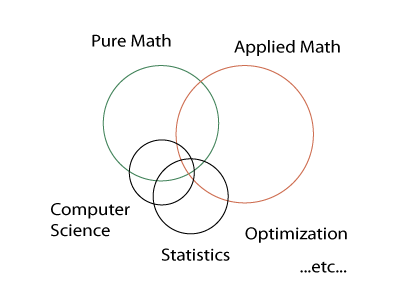 In fact, if you pick any two branches of math, there is probably an overlap.